Why are X, Y and Z axes represented by Red, Green, and Blue? 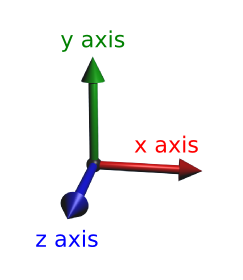 It is pretty standard that 3d axis, XYZ, is represented as red green blue, respectively. Why is this and who first proposed the colors in that configuration? If you are going to color the axes, RGB is the easiest scheme to use because it's the most commonly recognized triplex of colors. In other words, it's the most convenient mnemonic. 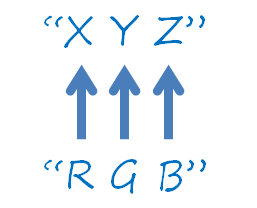 A given color can be found at the X,Y,Z coordinates corresponding to R,G,B. Color theory itself goes back quite a ways. The RGB model is described as originating in the late 19th century by "German and English scientists". The reason why the first component is right, the second component is up and the third component point towards the observer is the right hand rule used in the mathematics and physics. It is pretty standard and there are only very few exception (DirectX on Windows is one notable exception). The explanation in wikipedia is not easy to understand, more simple: Thumb up (first finger), stretch index finger (second finger, you have a 90°) and point middle finger out of the palm (third finger). This is the right-hand coordinate system. As the order of the components is set, the order of colors is in fact as user66808 correctly noticed the order of their frequency. While the wavelength has the inverse order, in physics you start the electromagnetic radiation from left with alternate current and end with X-rays and cosmic radiation at the right so light is ordered with increasing frequency. While this explains the question, I think there are some misconceptions here. First, red, green and blue are the primary components of creating color. A paper in the dark remains dark, but a monitor creates colored light and can therefore illuminate objects. 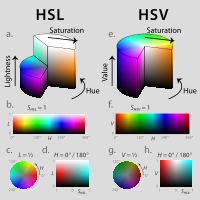 A monitor can create almost all colors (not exactly because some spectral colors cannot be created by RGB mixing), but a paper only modifies incoming light, so if you don't have white light, the paper color changes. The reason why the "standard colors" are more familar is that painting was invented first. Strictly speaking, the standard colors are not yellow, red and blue, but Cyan (blue-green), Magenta (Purple) and Yellow. Cyan absorbs red light strongly, magenta absorbs green light strongly and yellow absorbs blue light strongly; the other components are reflected back and create the perceived color by mixing the remaining components. So if you look at a cyan paper under red light, you see only a dark grey paper because there is nothing to be reflected. 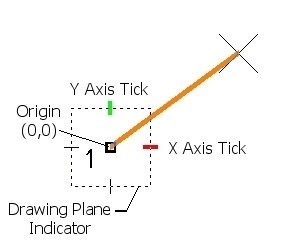 In the early 90's, I used red, green and blue lines to represent X Y and Z axes in my cad starter files (empty files that just had a few lines in them so you had somewhere to start drawing and orient yourself), because it just seemed logical. I was really into color theory, and I was very familiar with dealing with both rgb pixels and 3d points programmatically, both of which are triads of numbers. Then I wrote AccuDraw, in 1994 (patented in 95 and granted in 98 I think), and it used red and green for X and Y. I'm not sure if there was ever a reason to use blue for Z (even though Accudraw does 3d well), but in my head Z was blue. Later other things used it, someone mentions Maya in 1997. I'm going to say they were probably familiar with AccuDraw and got the idea from it. However, it also seemed rather obvious to me, so maybe they just decided to do it for the same reason I did. 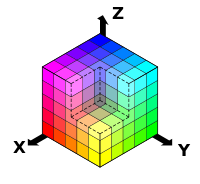 To answer the other part of the question, the first software I recall seeing the colored axes in was Maya, which uses the colors in the 3D manipulator tools as well as in the lower-left corner of each 3D view. Searching online, the earliest I've seen this scheme in use is in Maya's predecessor, PowerAnimator 8.5 (1997) -- as seen, for example, in a South Park making-of article. The same coloring does not appear to be present in 3D Studio R4 or Softimage Creative Environment 2.66 screenshots from around that time. 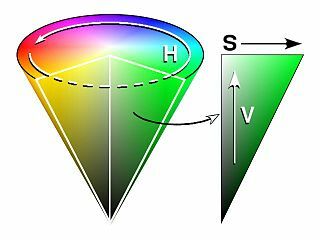 All the answers seeem to go off on a false premise, that it's a "standard" to color the axes red, green and blue but, in all my years of studying math, I have never, ever seen that except while on the topic of RGB in 3D graphics. If a chart is using red/green/blue to color the axes that way, I would not think anything of it myself and only believe it to be accidental or convenient to its creator. No other reason. The correct answer is extremely simple. Going back to the days of analog television technology, as it happens "RGB" was a commonly-used phrase. The technical reason WHY the colors red-green-blue were used as the triplex in the TV era, the "electronic" era of you will, the pre-digital era, can trivially be looked-up, and are not relevant: the simple fact is "RGB" was an extremely commonplace ... indeed the ONLY commonplace ... set of three colors, in that order, which were mentioned over and over in the "electronic era". Hence, those tree "famous colors, in that order" are used for 3D icons. There is utterly no, whatsoever, connection technically between the two. If the universe was France, the only famous "three colors" would be "blue, white, red" so those three colors would be used. However, "RGB" are the most completely commonplace three colors, so, they became used. There is utterly NO technical connection between the two realms. Please note that some of the answers here explain WHY tv technology used r, g and b. That's fine, but the fundamental reason those three are used in Maya, etc, is extremely simple: the most famous "color set of three" is indeed RGB: that's the only reason. Exactly as user19 asks in a comment above, "this is interesting, but doesnt really answer what i was trying to ask...." exactly. there is utterly no technical connection whatsoever between "tv technology" and why RGB are inevitably used in Maya, Unity3D etc. It was just, simply, the most famous phrase or idiom mentioning three colors. Other famous sets of "three colors" might be "red yellow green", but you never see the abbreviation "RYG". The abbreviation "RGB" is extremely simple and universal. I can't immediately think of any other sets of "three colors" that are commonly mentioned (for whatever reason) - other than national-flag related sets. "RGB" was just the inevitable choice, it's so "standard" and "everyone has heard it". Not the answer you're looking for? Browse other questions tagged color-scheme or ask your own question. Which colors would best convey 3 difficulty levels? Effect on usability if I use green and red colors (for meaning) in an app whose color scheme does not include those colors? 'Open' signs on commercial buildings - why are most of them red? Why is red associated to greatness in some websites? Is there a standard color list to keep adding new colors to a plot while retaining old colors?